The White Helmets members and their families will be resettled in Britain, Canada and Germany. ISRAEL HAS EVACUATED 800 White Helmets rescuers and their family members threatened by advancing Syrian regime forces to Jordan for resettlement in Britain, Canada and Germany. Israeli Prime Minister Benjamin Netanyahu called the operation an “important humanitarian step” and said he ordered it after requests from US President Donald Trump and Canadian premier Justin Trudeau. 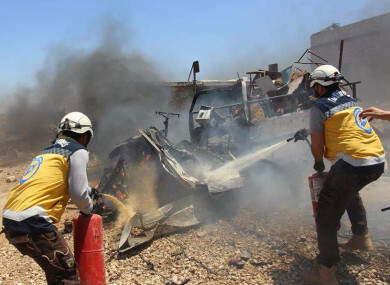 Founded in 2013, the Syria Civil Defence, or White Helmets, is a network of first responders which rescues the wounded in the aftermath of airstrikes, shelling or explosions in rebel-held territory. Jordan “authorised the United Nations to organise the passage of 800 Syrian citizens through Jordan to be resettled in western countries,” foreign ministry spokesman Mohammed al-Kayed said. The government gave the permission after Britain, Germany and Canada made a legally binding undertaking to resettle them within a specified period of time due to ‘a risk to their lives’. Several days ago President Trump contacted me, as did Canadian Prime Minister Trudeau and others, and requested that we assist in evacuating hundreds of White Helmets from Syria. These are people who have saved lives and whose lives were in danger. The Israeli military said it had transferred the rescue workers and their families to a neighbouring country, adding the operation was “exceptional” and that Israel would continue its “non-intervention policy” in the Syrian conflict. “A few days ago President Trump and Canadian Prime Minister Trudeau and others approached me with the request to help extract from Syria hundreds of White Helmets,” Netanyahu said in a statement. White Helmets head Raed Saleh said the evacuees had arrived in Jordan after being “surrounded in a dangerous region”. They had been encircled in the Syrian provinces of Daraa and Quneitra, which respectively border Jordan and the Israeli-occupied Golan Heights, he told AFP. Israel seized 1,200 square kilometres of the Golan from Syria in 1967, in a move never recognised internationally. Britain’s Foreign Office said it had helped facilitate the overnight evacuations. “White Helmets have been the target of attacks and, due to their high profile, we judged that, in these particular circumstances, the volunteers required immediate protection,” it said. German Interior Minister Horst Seehofer told Bild newspaper that Germany would take in eight White Helmets members and their families. The move was “an expression of my stance of ensuring humanity and order in migration policy,” he said. Canada will take in up to 50 White Helmets volunteers and their families, totalling up to 250 people, the country’s public broadcaster CBC said citing senior officials. Canadian Foreign Minister Chrystia Freeland said she had “called for global leadership to support and help these heroes” at last week’s NATO summit. Israel’s Haaretz daily said the evacuees also included orphans who had been injured in the Syrian fighting. It was unclear how many White Helmet volunteers remained in both the Daraa and Quneitra provinces after the evacuations. But a volunteer in Daraa city, who asked to remain anonymous, said he had decided to stay despite being given the choice to leave. “It’s our country and we have a right to live in it in safety,” he told AFP, however adding he was among a minority who wished to remain. We are first and foremost a humanitarian organisation, not a military one, or a terrorist one as the regime alleges. RESCUED: @SyriaCivilDef faced an immediate threat to their lives in Syria. We rescued hundreds of them and their families. They passed through Israel and are now out of harm's way. We conducted this life-saving mission at the request of the US, Canada, and EU countries. The White Helmets have rescued thousands of civilians trapped under the rubble or caught up in fighting in opposition-held zones along various fronts of Syria’s seven-year conflict. Since its formation, when Syria’s conflict was nearing its third year, more than 250 of its volunteers have been killed. The group’s motto — “To save one life is to save all of humanity” — is drawn from a verse in the Koran, although the White Helmets insist they treat all victims, regardless of religion. Some members have received training abroad, including in Turkey, returning to instruct colleagues on search-and-rescue techniques. The group receives funding from a number of governments, including Britain, Germany and the United States, but also solicits individual donations to purchase equipment such as its signature hard hats. On 19 June, Syrian government forces launched a Russia-backed offensive to retake Daraa and Quneitra provinces. Just a month later, regime forces have regained control of most of these two provinces through a combination of deadly bombardment and Moscow-brokered surrender deals. Jihadists are not party to these deals, and Russian planes bombarded a holdout of the Islamic State group in Daraa province overnight, a Britain-based war monitor said. More than 20,000 civilians have escaped bombardment on the IS-held corner in the past 24 hours, fleeing into regime-held areas, the Syrian Observatory for Human Rights said. Email “Syria: Hundreds of 'White Helmets' members evacuated to Jordan in Israeli operation ”. Feedback on “Syria: Hundreds of 'White Helmets' members evacuated to Jordan in Israeli operation ”.